The thyroid is a butterfly-shaped gland in your neck. Although small in size, it plays a significant role in your wellness by producing hormones that help regulate your metabolism, energy level, mood and body temperature. About one in eight women between ages 35 and 65 and one in five women over age 65 have a thyroid disease, according to women's health expert Dr. Christiane Northrup. If incorporated properly, oats can benefit a thyroid-friendly diet. As a whole grain, oats provide rich amounts of fiber, which can help minimize constipation associated with hypothyroidism, or an underactive thyroid. Oats also provide significant amounts of B vitamins and selenium -- nutrients important for proper thyroid function. 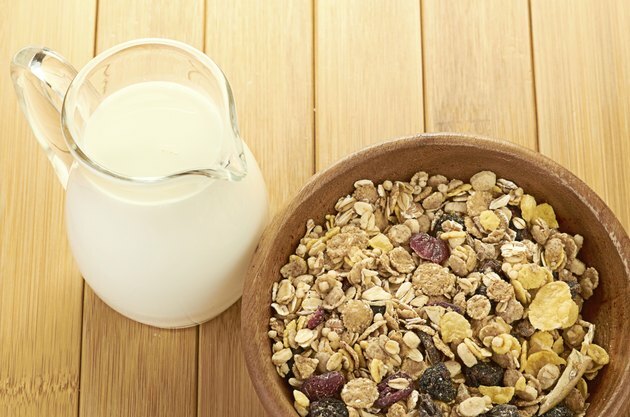 As a low-glycemic food, oats have a mild impact on your blood sugar. Lowering the glycemic impact of your diet may help restore healthy hormone levels, according to Dr. Christiane Northrup, and enhance appetite control, which may ease the process of weight management. A strong correlation exists between autoimmune thyroid disease, including Graves' and Hashimoto's diseases, and celiac disease, according to a "Today's Dietitian" article published in Nov. 2010. Celiac disease is an autoimmune disorder of the small intestine that interferes with nutrient absorption. Treatment for celiac disease generally involves strict avoidance of gluten -- a protein found in wheat, barley and rye. Although oats do not naturally contain gluten, commercially-prepared oats are often contaminated with barley or wheat. If you have celiac disease and consume oats contaminated by glutenous grains, you may experience abdominal pain, gas, bloating and diarrhea. If you enjoy and tolerate oats well, incorporate them into a nutritious, balanced diet, limited in foods that interfere with thyroid function. These foods, according to the University of Maryland Medical Center, include millet, pine nuts, peanuts, soybeans, linseed and cruciferous vegetables, such as broccoli, Brussels sprouts, cabbage, cauliflower and kale. Treatment for an overactive thyroid, or hyperthyroidism, typically involves a high-calorie diet. To add calories to oats, prepare it with milk instead of water and add calorie-dense topping, such as nuts, almond butter, flaxseeds or pure maple syrup. If you do not tolerate gluten, choose oats and oat products labeled "gluten-free" for ensured safety. Additional fiber-rich foods include beans, lentils, raspberries, pears, artichokes, green peas and other whole grains, such as brown rice, wild rice and popcorn. Eating antioxidant-rich foods, such as berries, tomatoes, squash and bell peppers, may help manage hypothyroidism symptoms, according to the UMMC. As low-calorie foods, fruits and vegetables may also help you stay within your calorie needs while managing excess weight. Omega-3 fatty acids, which are prevalent in walnuts, flaxseeds, canola oil and cold-water fish, such as salmon, mackerel and halibut, may help reduce inflammation and improve immune function.